Mickey Scarpato (Philip Seymour Hoffman) is a small time but connected street hustler in Philadelphia. When his wife’s (Christina Hendricks) son dies in suspicious circumstances Mickey does his best to keep it quiet. However a nosey and determined washed up alcoholic writer (Richard Jenkins) is determined to find out the truth. God’s Pocket is a place in Philadelphia. It’s a place of community, working class folks, and it doesn’t appreciate outsiders. The residents keep to themselves and it’s a place that’s reflective of many post-industrial blue-collar neighbourhoods. God’s Pocket is a depressed area economically and in John Slattery’s debut movie the folks themselves don’t seem much happier. The film is based on Pete Dexter’s novel of the same name and it involves the death of Scarpato’s stepson. The murder isn’t that unexpected though as the son is unpleasant, arrogant, and difficult to get along with. However when Scarpato loses the funeral money betting on a horse, he finds himself carting around the corpse. The literal weight of Mickey’s bad decisions is felt. In terms of tone this is an uneven film. God’s Pocket has the down trodden white masculinity inherent in many of Hoffman’s other roles but the absurdist edge found in the dialogue sits uneasily with much of the action. This isn’t a place where people get happy endings; instead it’s a place where people do what they can to survive. Realism it seems is an important influence on Slattery’s directorial debut. It sort of has to be as the plot itself involves a man losing what slight control he had to begin with. Hoffman’s Scarpato is an almost inept criminal and his focus should really be on his wife during her time of grief. It’s not. Instead Scarpato has to remain busy clearing up the mess he made of the funeral and the death of her son. God’s Pocket then is a film about a catastrophe and a series of unfortunate acts and bad decisions. It is an inherently human story and the introduction of Richard Jenkin’s alcoholic columnist Richard Shelburn adds a good complication to an already detailed plotline. Shelburn seems to have a particular focus on the narrative of God’s Pocket. But his problem is the fact that he is an outsider looking in. His perspective is that of a middle class man looking down on those less fortunate and he will never understand their reality. He waxes lyrical about the people and their struggles and romanticises the plight of the working poor. To Shelburn it’s all about the story whereas for Slattery and the overarching narrative of God’s Pocket the focus is on the people. There was another recent adaptation of a Pete Dexter novel from Lee Daniels. It was the colourful and pulpy The Paperboy (2012) and it dealt with similar issues and focussed on similar people. However God’s Pocket is a markedly different film. It’s smaller in scope, it’s a character study in minutia, but unlike The Paperboy it doesn’t especially lead anywhere. There is a specific moment of conflict that stands out in God’s Pocket but for most of the film the characters and their actions just seem ineffectual. In many ways the film feels like it was never quite finished. But for a directorial debut with such a considerable amount of celebrity actors it still has much going for it. There are marked similarities in God’s Pocket to the late Sidney Lumet’s Before the Devil Knows You’re Dead (2007) and Andrew Dominik’s Killing them Softly (2012). This is perhaps one of the problems with God’s Pocket. It feels like a bricolage, a pastiche of films and stories that we already know. This is a film worth seeing for Hoffman’s performance alone but there are also plenty of other reasons to watch it too. John Turturro plays Arthur, Mickey Scarpato’s dodgy accomplice, and Christina Hendrick’s does a great job conveying a fading neighbourhood beauty dealing with her bad news son (Caleb Landry Jones). Eddie Marsan also makes an appearance as tight fisted mortician Smilin’ Jack in a performance very similar to his recurring one on Showtime’s Ray Donovan (2013). This is a group film, an actor’s film, and it helps that John Slattery (himself a noted actor) helmed the piece. Yes, it could be a much more polished film but that would negate the fact that reality isn’t tidy or clean. Hoffman shines in this film as a bloated and charismatic lowlife. In a sense this is a good description of God’s Pocket as a whole. It’s not perfect, it’s flawed, but it’s also unapologetic. There’s something heartbreaking in Hoffman’s performance of a man on the edge, of a man out of control and in a desperate downward arc. Sometimes art reflects reality more than we intend it to and sometimes we put more of ourselves into the things we create than we realise. 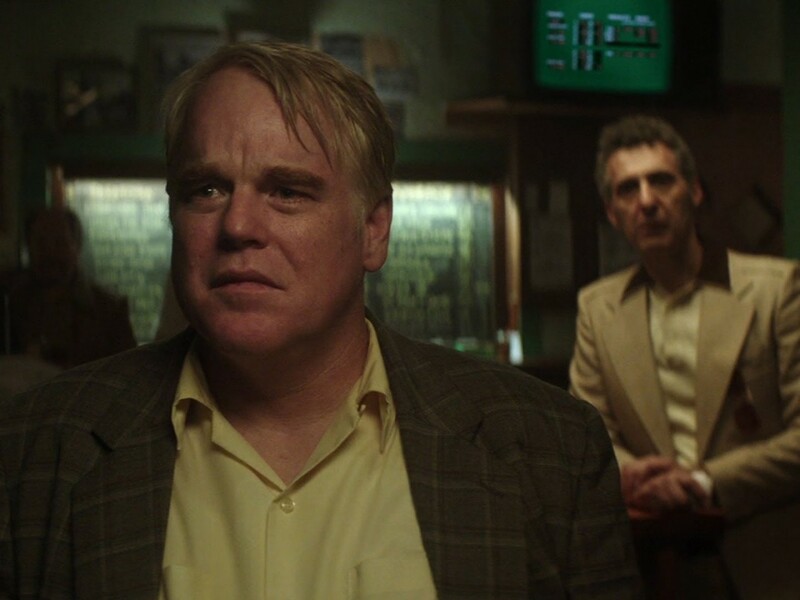 Philip Seymour Hoffman plays a role that seems very self referential and in it we see a final glimpse of that late great character actor.